The Slow Love book tour, such as it is, involves going places where I have friends and family, so that I can partake of guest rooms, as well as loving visits. I'm in Los Angeles, giving a talk to benefit the most excellent Garden Conservancy. I've written before about how I do not travel that well--actually, it isn't that, exactly; it is more that I become anxious ahead of time and must have everything in order before I leave. This time, rather than scrub tubs, I organized files and mailed in those estimated taxes that we sole proprietors are privileged to pay. I must say, though it is often a pain being one, (as in, finding health insurance) I like the ring of Sole Proprietor. Anyway, I'm at my brother's house. The first thing I do, if I can, when I visit a new place, is pick a bouquet of flowers. My sister-in-law had already graciously left a vase of roses by my bed. But I was drawn into the garden by the sharp scent of the yellow flower above, Mexican bush marigold (Tagetes lemmonii, the vivid purple of the "princess flower", Tibouchina urvilleana, the agapanthus, and the crimson bougainvillea. It is always astonishing to me to see California gardens. Things we struggle to grow as houseplants in the Northeast are used as hedges here. At home, I'm fussing with branches that are regularly sheered in LA. Amazing. No matter how many times I visit, I'm still moved by the sight of lemons and grapefruits hanging off the trees. I've also, in the last year, been packing my own tea when I hit the road, because it is the one thing that sets up my day properly. The best teas come from my friend Sebastian Beckwith's company, In Pursuit of Tea. He visits the growers all over Asia, knows exactly who is picking what, and how they are processed; I never fear that I am drinking a chemical brew in the morning with Sebastian's teas. I don't think I had ever tasted Earl Grey until I tasted his bergamot, though my mornings usually begin with white or green tea. They're a bit pricey, but amortized over the days...and one pot lasts me the day, because I can re-brew several times. Just the sight of the teapot, the scent of the flowers, the wink of my necklace curled in the dish...make me feel cozy. I can't wait for little Eva and Dexter to come home from school and play with me. I understand about seeing these plants that we find so hard to grow, when I go back to New Zealand from England I have the same feeling, I love to have a window seat when I fly over Auckland. Have a great trip. I feel the same way when I see all your pretty spring flowers that we cannot grow in the tropics: peonies (my fav! ), foxglove, phlox. I could list them forever. Even the apple and pear trees. I try to be thankful for our FL bounty though. Enjoy your California stay. I'm heading out right now to pick myself a little bouquet. Thanks for the lovely inspiration. I was terribly pleased with myself, about six years ago, when I finally managed to establish a single acanthus that actually bloomed in this humid garden. Two months later, I was visiting my 88 year old, French great-aunt in-law (sounds like a complicated connection, but it isn't) in Perpignan and offered to take out the trash. I distinctly recall making my way through the back graden and outbuildings to the back-lane....where I saw piles, heaps, and great mounds of blooming acanthus...vagrantly spilling up and out of the ditches as far as you could see. I have friends in Chapel Hill who make a great fuss (probably a deserved one) over their three, treasured clivias (which were expensively purchased from White Flower Farms years ago, and which require all sorts of complicated ferrying around the house if they're to catch the "right" light and just-maybe produce three blooms per year). The first year I stayed in Barcelona's Barri Gotica, I realized that they regard Clivia with exactly the same degree of enthusiasm as Georgians view kudzu. Finally?...I also recall exulting, a while back, over my three hanging baskets of lantana in front of an Indian friend (she'd grown up in New Delhi), who simply set down her drink and wearily declared "Oh, God....that stuff STINKS....my father used to make me and my sisters go out and clear that stuff away when we were bad. It grew EVERYWHERE......"
I wouldn't be the first to have noticed that one man's "trash" is another man's treasure. thanks for the evocative (as usual on your blog) posting. The first time I went to California, I stood awestruck in the middle of a friend's garden. It looked to my eyes as though designed by Walt Disney. I had to squeeze those lemons and grapefruits to make certain they were real. Thank you for the tea recommendation. I've recently discovered Peppermint tea at bedtime and have been sleeping like a baby all week. Enjoy your time in LA! Dear Dominique, Seasonal sprigs gathered from the garden are always, at least in my mind, much prettier than anything shop bought. I have always wanted to grow lemons [in pots of course] and have generally failed miserably. I agree completely that the sight of them simply dripping from the trees in California would be wonderful. I avoid flying, much preferring the train, and, of course, as you would expect of an English woman, drink tea constantly. Yes 2 T! Organic green and white, re-infuse the same pot all day long, and of course travel with it. Even take thermos of it when out for the day. Or a specially designed go-cup for tea (a little filter at the top) that I put the leaves in and then spend the day searching for sources of hot water. a way to make friends and get a sense of a place---finding the (hot water) well. 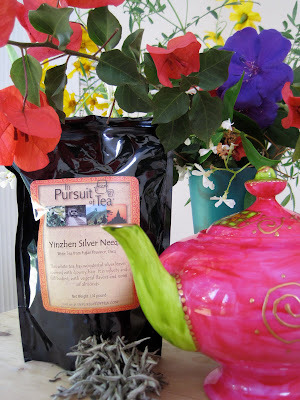 Thank you for sharing your Earl Grey treasure, made my order now my morning ritual will be complete. Your bouquet looks really charming. I love the mix of flowers, and colors. And the teapot, wow. Another topic. Did you mention the book 'The Forest for the Trees' by Betsy Lerner in 'Slow Life'? Is that how I found it? I can't remember. If not, pick it up and read it, AWESOME.